This is actually a scheduled post – I’m currently back in Singapore for a short holiday! But don’t worry I’ve scheduled another Hokkaido Chiffon Cupcake recipe in the next few days before I’m back, so stay tuned! And do remember to sign up to my mailing list before 25 Dec as I’m sending out a free eCookBook on that day! Please also pardon me if I do not reply to your questions promptly or am lagging behind in visiting your blogs! Have a merry merry Christmas and a happy happy new year! 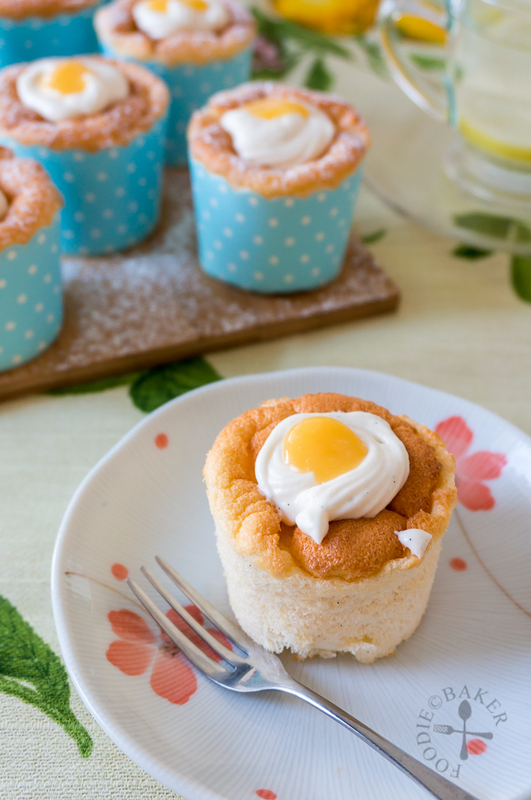 When X came home and saw this batch of Hokkaido Chiffon Cupcakes, he wanted to ask, “Why is there an egg on top of the cake?” It does look like an shiny and oozy egg yolk, doesn’t it? But of course I will not plop a cooked egg on top of a cake, which would have been really weird. The yellow goodness is actually lemon curd! I really like lemon treats (though X is not very fond of them) – the tanginess makes a dessert so refreshingly delicious. 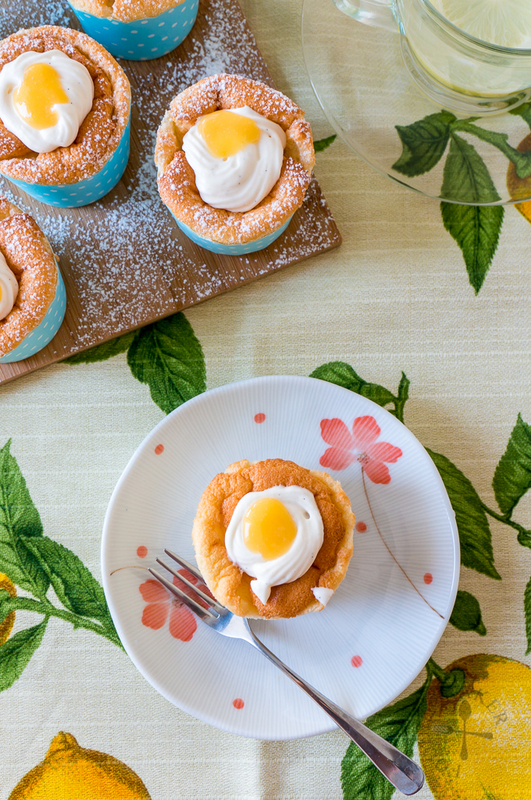 This lemon curd recipe uses only 1 egg yolk, which is perfect to use up the leftover egg yolk from the chiffon cake recipe. 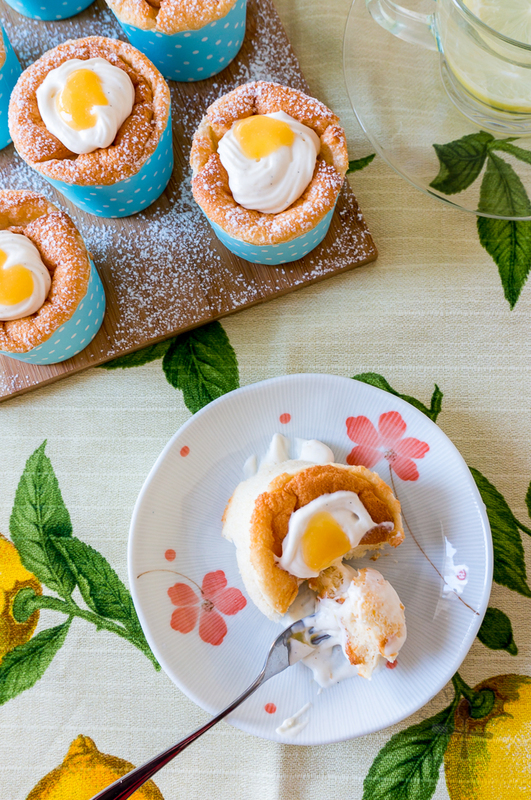 I mixed most of the lemon curd into the vanilla whipped cream while saving some to dollop on top for decoration, hence accidentally creating an “egg effect” on these cupcakes. 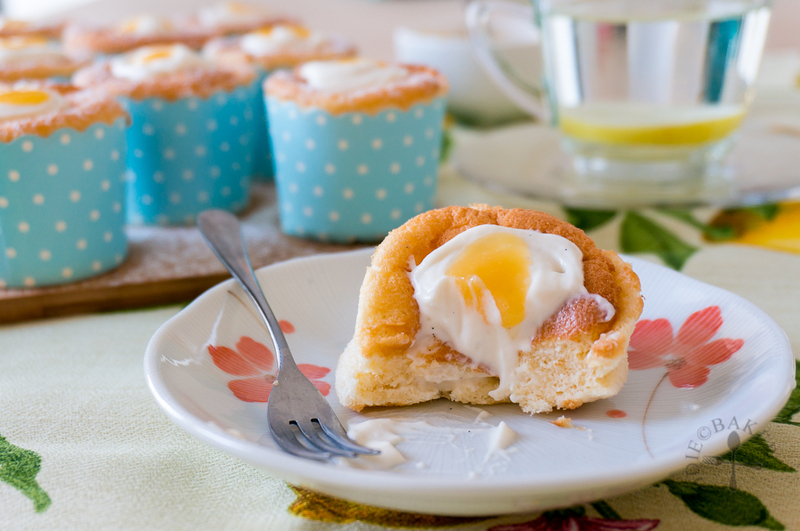 For the step-by-step photos, please refer to Pandan Hokkaido Chiffon Cupcakes and Lemon Cheesecake. Egg Yolk Batter: Whisk all the ingredients together in a mixing bowl with a wire whisk until incorporated. Set aside. Egg White Batter: Get another mixing bowl (preferably metal) and make sure it's dry and oil-free. Add in the egg whites and beat with an electric mixer on medium-low speed until foamy. Add in the salt and beat the egg whites on medium speed. While the mixer is running, add in the sugar gradually. Once all the sugar has been added, turn the mixer speed up to medium-high and beat until stiff peaks formed. Add ⅓ of the Egg White Batter into the Egg Yolk Batter. Using the wire whisk, fold in the egg whites to loosen the mixture. Fold in the remaining Egg White Batter gently with the wire whisk. Change to a rubber spatula and scrape up the bottom of the mixing bowl a few times, making sure that both batters are mixed well together. Divide the batter among 8 cupcake liners (10 to 12 if using standard-size cupcake liners) and bake for 18 to 20 minutes, until a skewer inserted into the center comes out clean. The cupcakes will puff during baking then shrink slightly as it cools. Let the cupcakes cool completely on a wire rack. Whipped Cream Filling: Chill a bowl and the beaters (of the electric mixer) in the refrigerator for 30 minutes. Place the whipping cream and sugar into the chilled bowl and beat on medium to medium-high speed until stiff peaks formed. Beat in the lemon curd until incorporated. Transfer the whipped cream into a piping bag fitted with a large star tip. Poke the cupcakes in the middle with the star tip and squeeze in the whipped cream until the cupcakes is slightly puffed. Remove and pipe a small star on top as decoration if desired. Dust with icing sugar, plop a bit more lemon curd on top and serve. Store any leftover cupcakes in an airtight container in the refrigerator and consume within 5 days. Beat egg yolk with a wire whisk in a mixing bowl. Set aside. Place lemon juice, sugar and lemon zest in a small pot and bring to a simmer. Whisk the egg yolk again with a wire whisk then slowly add in the boiling lemon juice mixture - drop by drop then in a tiny stream until ⅔ of the lemon juice mixture is added, whisking the egg yolk constantly. This tempers the egg and prevent it from scrambling later on. Pour the egg yolk mixture back into the pot and place it over medium heat. Cook, stirring frequently with a spatula, until the mixture is thick enough to coat the back of a spoon. Remove the pot from heat and place in the bowl of ice water to stop the cooking. Stir frequently until the lemon curd has cooled down before using. - If using standard-size cupcake liners, the recipe will yield 10 to 12 cupcakes. As the square cupcake holders I used are bigger than standard-size, I only yield 8 cupcakes. - Fill the cupcake liners 80% full if you want it to balloon out of the cupcake holders. 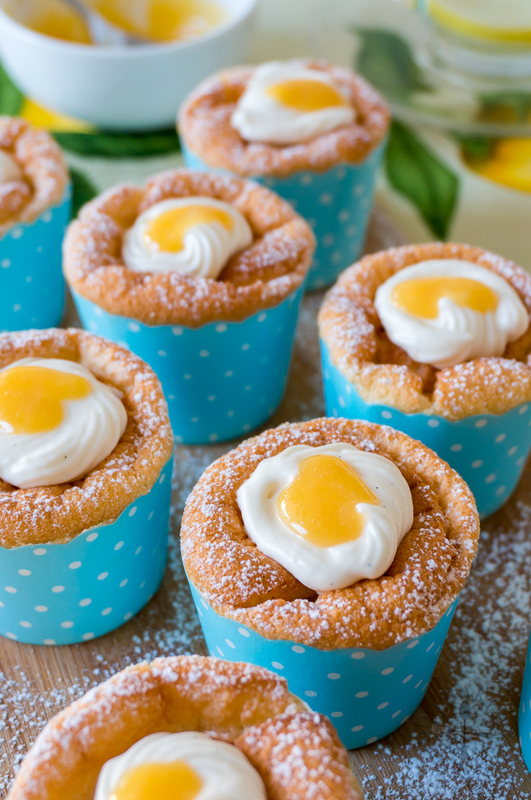 If you don't want it to rise above the cupcake holders, don't fill them as full. The chiffon cupcakes look great! I love lemons! I really do! And I can smell the perfect scent of lemon in your perfectly made cupcakes! YUM! The little sponge cupcakes look delicious! I love lemon curds and custards and topping the cakes like that is a brilliant idea. A little tang but not overpowering. Hope you’re having a wonderful holiday with your family, Jasline! Merry Christmas and a very Happy New Year to you! Oh, this is such a gorgeous cupcake, Jasline. Happy Holidays!